A bag of Lemon Meringue Marshmallows have been in my cupboard just waiting for a reason to be opened. 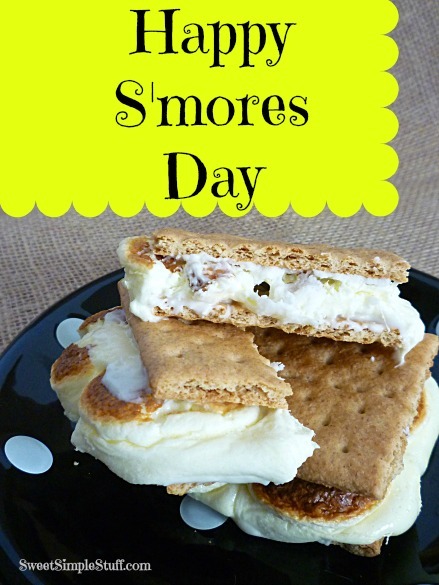 Today was the day … in honor of S’mores Day, August 10! 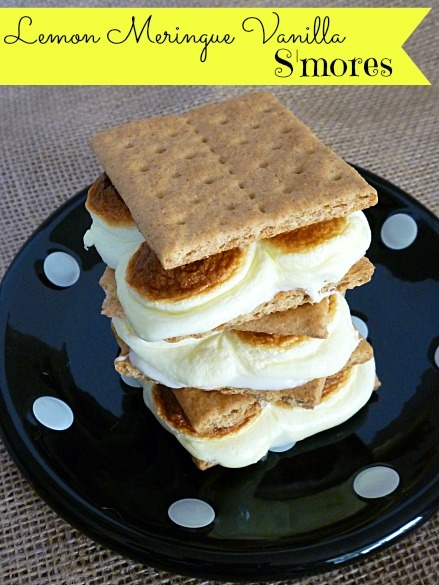 These s’mores are a definitely not your typical ones … they are not only lemon, but I used Vanilla CandiQuik too! 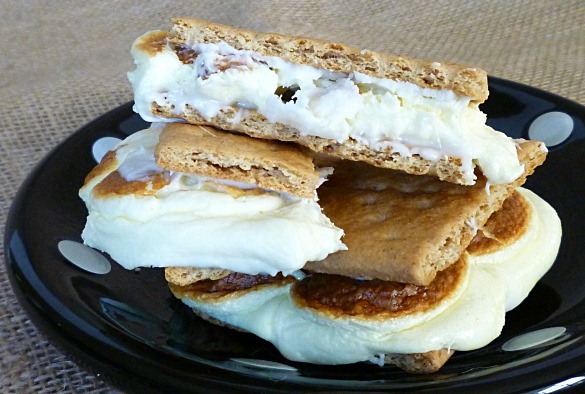 That’s right lemon marshmallows and white chocolate/candy coating on graham crackers … yum! There is one more thing that I should mention … they are so easy peasy to make. You could actually get everything assembled several days in advance! No campfire is necessary … they are toasted in the oven … literally in a minute! Turn the oven broiler on and let it heat up. 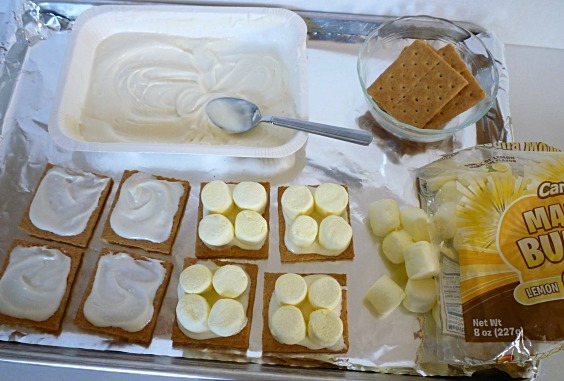 Place the graham crackers with marshmallows on a foil lined (for easy clean up) tray. Keep the graham crackers with candy only aside. Place the tray under the broiler and watch it constantly … this toasty brown color happened in 1 minute!!! Oh, you’re terrible. :} It’s 3:15 in the AM and I want one and want one Now. Oh how I wish I could reach in and grab one from you. Lemon mallows and CandiQuik; what a way to my appetite right now. Guess I will just have to settle for some toast with some homemade blueberry jam even tho I would much rather have one of these S’mores. With cool front coming in; we just may get down to 100 deg. Happy S’Mores Day!! These look YUMMY!!! My mouth is watering! I want one! 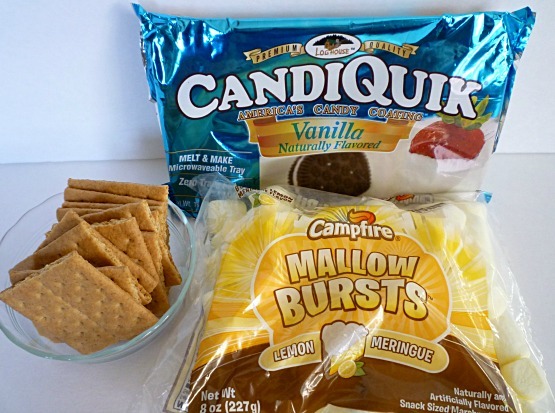 I do not have the lemon mellows but I do have the grahams/candy quick and KEY LIME MELLOWS……plus I have company this is a great day!!!!!!!!!!!! Key Lime would be delicious 😉 Did you make them and enjoy? Brenda, I’ve been to Walmart three times this week. Oh we’ll, I might as well make another trip just to get those marshmallows. As much as I love normal s’mores, your version sounds delicious. Thank you Kathleen 😉 Walmart is about 15 miles away (thank goodness)… that saves me from going three times in a week! My mouth is watering with all the scrumptious recipe!! 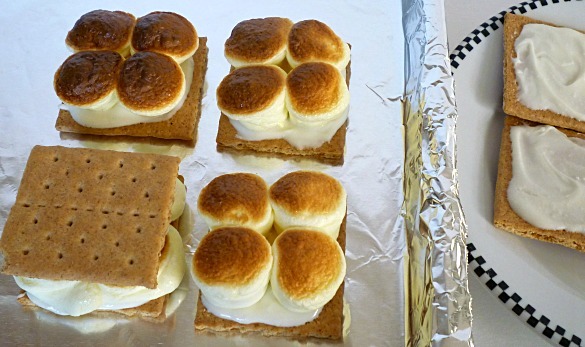 I’d love to have s’mores….lol!! Thanks for the great recipe!! I finally located the lemon marshmallows and key lime too. However, they were so sticky that they clumped together in the bag. There wasn’t any coating on them such as corn starch. Did you have this problem? Patti, I did not have that problem with my lemon marshmallows. However, I’ve had it happen in the past … not sure if they just get squished, old or if humidity makes a difference. Did you use them? Were they OK?